I obtained this figure in the same way as the preceding figure. The Philadelphia Free Museum of Science and Art has an example of the finished pattern, No. 22713, collected by Mr. Stewart Culin at St. Michael's Mission, Arizona, and called Tsun-tsi = Big Star. Second: Transfer the thumb loops to the middle fingers, by bending each middle finger toward you over the index loop, and taking up from below on the back of the finger the far thumb string (Fig. 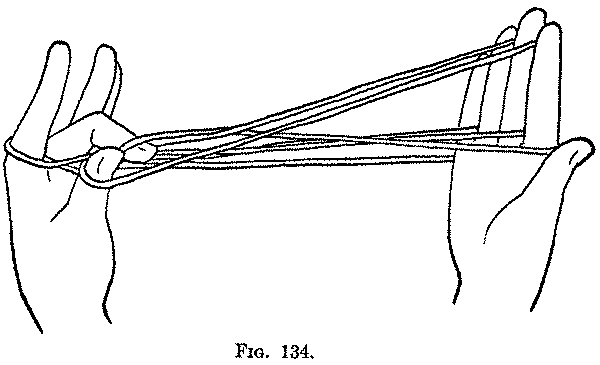 134, Left hand); withdraw each thumb from its loop, and return the middle finger to its position (Fig. 134, Right hand). Third: Then complete the figure by doing the Fourth, Fifth, Sixth and Seventh movements of "Many Stars" (Fig. 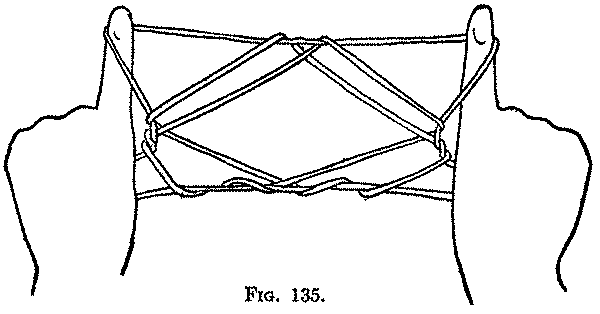 135). The "North Star" differs from "Many Stars" only by the omission of the Second movement.